Although my favorite thing to read is a novel, I also love linked collections of short stories. The forgiving nature of a series of discrete narratives doesn’t make me feel guilty when my schoolwork prevents me from reading a novel straight through. Sometimes these collections are linked by place; there are many of these. Others are linked by characters, such as Justin Cronin’s Mary and O’Neill. By an object: Susan Vreeland’s Girl in Hyacinth Blue. Some by concept: Her Infinite Variety by Pamela Rafael Berkman. Sometimes by theme: Drinking Coffee Elsewhere by Z.Z. Packer. And sometimes a collection is linked by all of these. Printz Award-winning Midwinterblood by Marcus Sedgwick contains seven linked stories which travel backward in time on a remote and unusual island near the top of the world. They explore the themes of love and sacrifice in the myriad ways that love and sacrifice impress themselves on our lives, sometimes obvious and sometimes not. But the writing is never obvious, never predictable. Sedgwick’s work is often, I think, categorized as YA, but even if you don’t usually read in that category, give this one a try. Eric and Merle are two characters who orbit each other in time, meeting each other in different ways. Sometimes in love, sometimes bound by a family relationship, sometimes tossed together by external forces, their interactions show the breadth of love and sacrifice. The writing is lush without overpowering the reader. The stories are based on an actual historical painting, Midvinterblot, but everything else in the novel comes from Sedgwick’s own imagination. Honestly, I don’t know what else to say about this book that won’t give too much of the story away. Aside from the writing being enjoyable even down to the level of the sentence, I love the structure, how each story is illuminated by a subsequent one, how the orbit comes around in such a satisfying way, how the island itself is a character, how the names of the characters evolve, how the dragon flowers on the island and the image of the hare anchor the narrative. There is a hint of the fantastical in this book, but I wouldn’t call it fantasy; magic realism is more its purview. This novel-in-stories accomplishes what the 1994 film Being Human tried to do but couldn’t. Midwinterblood captures two important facets of the immensity of human experience with crystalline clarity. And like a faceted prism, this story reveals a depth of possibility in every interaction, that we are part of something larger than ourselves. That love and sacrifice cannot be contained. It asks the question, is life truly this rich? Every now and then, we have a WWW guest post from a female writer who isn’t a published author in the traditional sense (that is, she doesn’t have a book out) but who does have a thriving and regular blog which she writes for. And even though it’s true that almost anyone can have a blog and slap some content up into the Interwebz, cultivating and producing a quality blog takes work, creativity, dedication, and skill. It’s not easy, no matter how easy it might look to someone else. Today’s review comes to us from Nerija, whose blog Postcards from La-La Land is worth checking out. When I saw her review of Rainbow Rowell’s Fangirl there, I asked her to share it with the Women Writers Wednesday series, and she graciously obliged. What follows here is a longer/modified version of her review, which was originally posted here. This week’s response is to one of my childhood favorites, Anne of Green Gables. I could tell you stories of how that book mattered to me when I was in junior high (now called middle school), but they would seem utterly banal next to this lovely response from J.G. Lucas. I have no place reviewing Anne of Green Gables, by L.M. Montgomery. It is wonderful. If you haven’t read it, you should. The book has been around for 106 years and has sold millions of copies. There is nothing I could write about its contents that hasn’t been written before. That said, the beauty of writing or art of any kind, is the way it transforms when experienced by each person. Anne changed and continues to change me, and I change her by the way I experience her. My first exposure to the Anne series was at my friend Diane’s house. I was eleven, and I saw the whole set on her shelf in a room that I remember being very yellow. The covers were girly and scripty, and they did not appeal to me at all. Anne in those covers always stood (or sat) looking wistfully into the distance. She was nothing like my fictional heroines, Meg from A Wrinkle in Time, Lucy and Jill from Narnia, or Jo from Little Women. Diane offered to loan the books to me, and I declined (possibly disdainfully). Thirteen years later, I was working in a large university library, and I found Anne of Green Gables alone, apart from the rest of the series. This time, the cover was leather, the pages were thick parchment, and the book smelled and felt amazing. Is there any more comforting smell than old book? I checked it out to myself. The next day I packed it in my bag of things I needed to take to the hospital, where I would sit in the waiting room while my husband had a simple biopsy. Anne was the only one with me that day as the routine two-hour operation turned into an eight-hour ordeal. Using L.M. Montgomery’s words, Anne told me about her life, her beautiful island, her bright imagination, and the people who grew to love her. She and I watched the clock. At first, she distracted me with her story. As the hours stretched, she comforted me. I wish I could have kept that book, but I didn’t need it. The binding and perfume of the paper caught my attention, but the words stole my heart. Given Anne’s age and how beloved she is, her words are everywhere. I discovered the Gutenberg Book Project a couple of years later when I was an angry, drifting young widow working as a secretary in a drafty office. There was more time than work to do. I looked like I was busy on the computer, but I was reading Anne. And again, she helped. She reminded me that spring would come, that there were beautiful things in the world, and that you could find happiness and friendship even during grief. Later still, I moved away from my home and started over. And I read Anne. This time, she told me about being brave and learning to trust. I was so fortunate to find love again and to start a family again. And I read Anne. Over the years, I can’t count the number of times I’ve read Anne. I read her at least twice a year, but as often as once a month. When I want to be intrigued, frightened or entertained, I try a new book. When my soul needs a hand to hold, I read Anne. I smile, sigh, and cry every time. My heart swells every time Marilla realizes she loves Anne. I shiver every time Matthew gives her the brown gloria dress. At the end, I cry and am proud of Anne, every time. 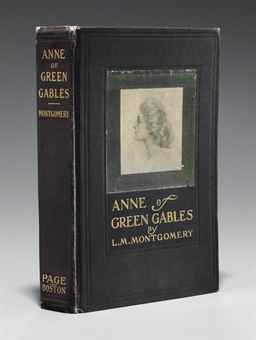 There are accounts that Anne’s creator, Lucy Maud Montgomery, was incredibly unhappy, especially later in life, and that she wrote to escape her harsh existence. As a writer, I don’t really believe that. Instead, I believe her harsh existence happened in between the times when she was writing. Her characters whispered to her, and she wrote them. She wrote Anne almost until the end. I know there were people who loved Anne like me and who sent L.M. Montgomery letters thanking her for her books. I like to think those letters helped her. Because of Anne, she is immortal, and her immortality is sweet, touching, beautiful and loving. I hope she knows that and is happy. J.G. Lucas is a writer living in Florida with her family and a variety of cats. Her debut novel, Bright Aster, is available through Amazon U.S. and Amazon U.K. She blogs here and here.